Even if you can't find a solar telescope to watch the Mercury transit on Monday (May 9), you don't have to miss the action: NASA will have three satellites watching the planet pass across the face of the sun, with one satellite providing nearly real-time imagery to skywatchers online. For those without access to those tools, a near-real-time feed of images will be available throughout the event at nasa.gov/transit. During Monday's transit, the Solar and Heliospheric Observatory (SOHO), which is operated by NASA and the European Space Agency, will measure the sun's rotational axis using two instruments that have been shut off for five years but will be turned back on to witness the event: the Extreme ultraviolet Imaging Telescope and the Michelson Doppler Imager. Meanwhile, NASA's Solar Dynamics Observatory (SDO) will align its instruments using the transit. This is possible because scientists know so precisely where Mercury is supposed to be in relation to the sun. Researchers will also compare SDO measurements of the transit with SOHO's. "Instruments on board SDO and SOHO use different spectral lines, different wavelengths, and they have slightly different optical properties to study solar oscillations," SOHO project scientist Joseph Gurman said in a statement. "Transit measurements will help us better determine the solar rotation axis." NASA, along with several other space agencies, will also observe the transit using Japan's Hinode satellite. Hinode is led by the Japanese Aerospace Exploration Agency (JAXA) and is used in collaboration with NASA, the European Space Agency and the U.K. Space Agency. 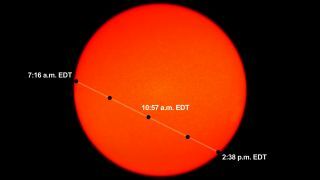 The first telescope observation of a Mercury transit occurred in 1631, NASA officials said in the statement. At the time, it showed astronomers how big Mercury's disk appeared and also helped them figure out the distance between the Earth and the sun.